I hate to admit it, but I’ve succumbed to the seasonal pumpkin-everything-craze lately. In my defense, my applications are less pumpkin-specific and more squash-inclusive. Squash is in season (duh), and it would be silly not to use it. And I figure plenty of people are hankering for every pumpkin recipe they can get their paws on until December, when pumpkin vanishes from the cool scene in favor of nutmeg and gingerbread. So here ya go: a warm, carby comfort food reminiscent of Cream of Wheat. One of my favorite foods from Korea. Hobakjuk, or pumpkin soup. 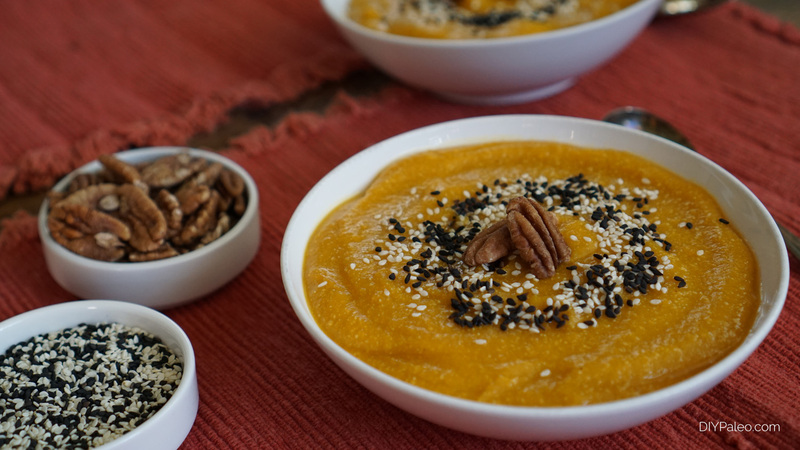 If you want to get nit-picky, hobakjuk is actually squash soup. 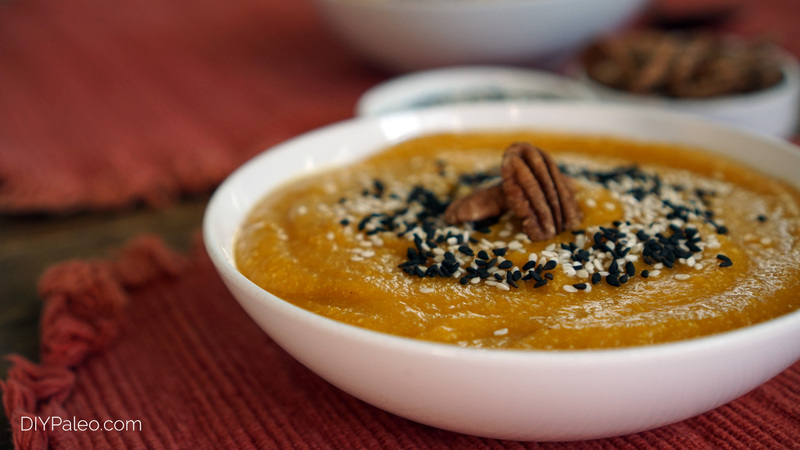 You can make this with kabocha or butternut squash if pie pumpkins are unavailable. Just be sure to bake the squash until it’s very soft so that it’s easy to blend. My favorite memory of eating this soup took place not too long after I arrived in Korea. I couldn’t read anything on the restaurant menu yet, but I had come down with a nasty cold and was aching for something to soothe my throat. I’m not sure whether my friend ordered the soup for me, or whether I pointed at a photo on the menu and said “THAT PLEASE”. Either way, a bowl of smooth hobakjuk was set in front of me, and I felt like a new woman by the end of lunchtime. The super-authentic way to eat hobakjuk is with red beans. However, I am morally opposed to red beans and have excluded them from this recipe. Why, you ask? Because red bean paste looks like chocolate and has deceived me more than once. After I left Korea, I swore I’d never eat them again—intentionally or not. Add them if you want. Whatever. The other optional part is the rice dumplings. I tried a few renditions of the dumplings with different flours—arrowroot, tapioca, and almond, to name a few. The tapioca/arrowroot combination reminded me too much of the tapioca balls in boba tea. Nothing seemed to work as well as the traditional sweet rice flour. I know white rice isn’t strict Paleo, so feel free to leave out the dumplings if that matters to you. If using a pie pumpkin, cut it in half and scoop out the seeds. Bake the two halves face-down at 375° for 45 minutes, or until very soft. Scoop out the cooked pumpkin from the skin and place in a blender or food processor and blend until smooth. Add pumpkin to a large saucepan with the rest of the ingredients and cook over medium, stirring constantly and scraping the bottom of the pot to prevent sticking. When it just starts to bubble, turn it off. Stir in rice dumplings and serve with sesame seeds and chopped pecans. While pumpkin is baking, measure rice flour into a bowl and add hot water until a sticky dough forms. You should be able to pinch off pieces of dough and roll them into almond-sized dumplings without them falling apart or sticking too much to your hands. You may need to adjust the amount of water or flour. Set dumplings aside and boil another pot of water. Add dumplings to the pot and give them a stir to prevent sticking. Boil 10 minutes, then remove with a slotted spoon and set aside. Add dumplings after the hobakjuk has finished cooking.